League One Northampton Town came from behind to beat Premier League side West Bromwich Albion on penalties in the EFL Cup second round. Zander Diamond put the Cobblers ahead when he nodded in Brendan Moloney's cross before James McClean levelled. Gareth McAuley headed in Matt Phillips' free-kick to put Albion ahead but Alex Revell's goal led to extra time. After a goalless 30 minutes, Kenji Gorre scored the decisive penalty following James Morrison's miss. Baggies striker Saido Berahino, who had a short spell on loan with Northampton in 2011, put his penalty wide before the home side's John-Joe O'Toole saw his spot-kick saved. Darren Fletcher and Alex Revell both scored with their efforts but Cobblers goalkeeper Adam Smith saved Morrison's penalty to give Gorre the chance to send his side through to the third round for the first time since 2010-11. The victory extended Northampton's unbeaten run in all competitions to 26 games, their last defeat coming against MK Dons in the FA Cup fourth round in January. Northampton Town match-winner Kenji Gorre: "When it left my boot I knew it was in and I started running before it hit the net - it was crazy. "We had our fans close by and they were great throughout the whole game. To run over to them was class. They were so loud, I just started running to everyone." West Brom boss Tony Pulis: "I wish Northampton all the best. They worked really hard and kept at it. "If we have come here and didn't open them up and didn't play well then you can slaughter us, but we did that. We've not hit the back of the net and that's what you have to do. "I understand supporters - if you're not winning you're not going to be happy, whether it's me or another manager." Match ends, Northampton Town 2(4), West Bromwich Albion 2(3). Penalty Shootout ends, Northampton Town 2(4), West Bromwich Albion 2(3). Goal! Northampton Town 2(4), West Bromwich Albion 2(3). Kenji Gorré (Northampton Town) converts the penalty with a right footed shot to the bottom right corner. Penalty saved! James Morrison (West Bromwich Albion) fails to capitalise on this great opportunity, right footed shot saved in the bottom left corner. Goal! Northampton Town 2(3), West Bromwich Albion 2(3). Alex Revell (Northampton Town) converts the penalty with a right footed shot to the bottom left corner. Goal! Northampton Town 2(2), West Bromwich Albion 2(3). Matt Phillips (West Bromwich Albion) converts the penalty with a right footed shot to the centre of the goal. Goal! Northampton Town 2(2), West Bromwich Albion 2(2). Darren Fletcher (West Bromwich Albion) converts the penalty with a right footed shot to the bottom right corner. Goal! Northampton Town 2(2), West Bromwich Albion 2(1). Matthew Taylor (Northampton Town) converts the penalty with a left footed shot to the bottom left corner. Penalty missed! Bad penalty by Saido Berahino (West Bromwich Albion) right footed shot is close, but misses to the right. Saido Berahino should be disappointed. Goal! 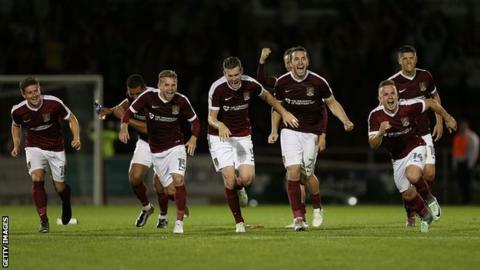 Northampton Town 2(1), West Bromwich Albion 2(1). Sam Hoskins (Northampton Town) converts the penalty with a right footed shot to the bottom left corner. Goal! Northampton Town 2, West Bromwich Albion 2(1). Salomón Rondón (West Bromwich Albion) converts the penalty with a right footed shot to the bottom right corner. Penalty Shootout begins Northampton Town 2, West Bromwich Albion 2. Second Half Extra Time ends, Northampton Town 2, West Bromwich Albion 2. Adam Smith (Northampton Town) is shown the yellow card. Corner, West Bromwich Albion. Conceded by Sam Hoskins. Attempt missed. Matt Phillips (West Bromwich Albion) right footed shot from outside the box is high and wide to the left. Attempt missed. Saido Berahino (West Bromwich Albion) right footed shot from the centre of the box is too high. Attempt missed. Kane Wilson (West Bromwich Albion) right footed shot from outside the box misses to the right. Aaron Phillips (Northampton Town) wins a free kick on the left wing. Foul by Kane Wilson (West Bromwich Albion). Corner, Northampton Town. Conceded by Boaz Myhill. Attempt saved. Kenji Gorré (Northampton Town) right footed shot from the left side of the box is saved in the bottom left corner. Attempt saved. Alex Revell (Northampton Town) left footed shot from outside the box is saved in the centre of the goal. Second Half Extra Time begins Northampton Town 2, West Bromwich Albion 2. First Half Extra Time ends, Northampton Town 2, West Bromwich Albion 2. Attempt missed. Matt Phillips (West Bromwich Albion) left footed shot from the right side of the box misses to the left. Corner, Northampton Town. Conceded by Jonas Olsson. Corner, Northampton Town. Conceded by Kane Wilson. Hand ball by Salomón Rondón (West Bromwich Albion). Attempt missed. Matthew Taylor (Northampton Town) left footed shot from the left side of the box is close, but misses the top right corner. Attempt saved. Salomón Rondón (West Bromwich Albion) right footed shot from outside the box is saved in the centre of the goal. First Half Extra Time begins Northampton Town 2, West Bromwich Albion 2. Second Half ends, Northampton Town 2, West Bromwich Albion 2. Corner, Northampton Town. Conceded by Gareth McAuley.